European Auto Repair | German Sport, Inc.
European auto repair Concord, Walnut Creek and surrounding areas trust. It’s no surprise that your vehicle is one of the most important aspects of your daily life, but what happens when something goes wrong? The only logical fix is to find a qualified auto repair shop. Well you are in luck because German Sport is the most trusted facility for European auto repair in the Concord area. 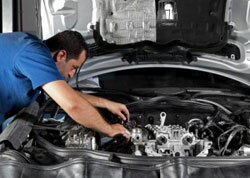 We specialize in auto maintenance and auto repair services. No matter what the job entails we are here to help. German Sport has been in the auto maintenance and auto repair industry since 1986. Providing top of the line services is our dedication to you our customers. We have received top honors for our customer satisfaction. Your car gets treated just as well, with the best replacement parts available. All of our work and parts are backed by our 12 month/12,000 mile warranty to help further ensure our dedication to you. So if you’re in the Concord area and are in need of European auto repair then contact German Sport today.